Typified by the old joke – “If I wanted to get to there, I wouldn’t start out from here!” A B.A. in modern languages from UCC many years ago, years working in tourism and in the dairy industry, during which time I completed an evening course in DIT resulting in a Diploma on Management Law (DIT) and a BSc(Mgt) from TCD. Then a couple of years working with Dublin City Businesses topped off with evening and weekend Library Assistant work in both the Mercer and St. Luke’s Hospital Libraries. I felt – finally! – I’d found my niche and owe a debt of gratitude to both Gay Doyle (former Librarian in St. Luke’s) and to Beatrice Doran (former Chief Librarian, Mercer Library) for their assistance and encouragement. I returned to College and got my DLIS from UCD in 2004. My first professional Library role was on the TextAccess project based in TCD and sponsored by AHEAD (Association for Higher Education Access & Disabilities. I’ve been in my current role for the past 9 years. I’m based in the University Hospital Library and during the academic year we generally have students as physical users while staff are mostly “virtual” from both the University and the Private Hospitals. Student needs are minimal really – an introductory talk and visit, book loans and – the bane of my life! – printing/photocopying. Staff needs are what occupy the largest part of my day. Clinical professionals are (almost) all obliged to engage in audits, research and CPD to maintain their professional status and hospital librarians assist with developing their search strategies, sourcing and provisionally appraising the literature and offering training or refresher sessions on the use of key clinical databases. A basic but comprehensive search will take between 3 and 8 hours so that can leave me with very little time for anything else. On a proactive basis, I send out a bi-monthly alerts bulletin to all staff as well as a number of targeted alerts by request. I’m also involved in literature searching for the NCCP and am on the HSLG Committee as CPD officer. Searching (and finding! ), training, informing, research, data management – these all feature on a regular basis. I’m team leader on a research project set up by the American MLA (Medical Library Association) and even though there’s never enough time to devote to it during working hours it’s an interesting hands-on way to develop my research skills. It’s not entirely non-traditional but advocacy and promoting our services is constant and each year I try, with my colleagues, to come up with ways to maximise and promote the use of the Library, the Librarians and the resources we provide. In addition, there is more pressure to quantify your contribution and align it with the main goals of the hospital but it’s something that we now try to do on a regular basis. I have, with my former colleague Breda Bennett from our sister hospital, St. Michael’s, carried out an audit on the impact and value of the service and this provided good qualitative evidence but identifying quantitative evidence is more challenging. Mostly databases – subscribed and more frequently, open access, such as PubMed, PeDRO, TRIP Database etc. Also reference management software such as Zotero or EndNoteWeb. One thing to expect when working in a hospital library is that access to anything Google- or social media-related will most likely be blocked by the firewall as a failsafe to avoid any possible breaches of confidential patient files. The hospital has just subscribed to Moodle though, and I’m looking forward to getting constructive and creative with that. It’s great to get feedback from staff saying that the help you provided is benefitting real live patients who are of course our ultimate end-users. This is a toss-up between staying up to date with my own CPD needs and trying to find time to get everything on the to-do list completed on time every time. IT issues are ever-present, firewall restrictions means that I spend a lot of time looking for workarounds because I can’t use the nice free web tool that would do the job most conveniently. Like most libraries, our staff numbers dropped during the lean years and it goes against the grain to say “no” to any request especially when we have worked so hard to raise our profile so we are still struggling to provide the same service with minus one-third of the Library staff. CPD is crucial but finding the time and the money to keep attend the necessary courses is a challenge. I did complete a MOOC but there’s a learning curve to these. Room for cautious optimism here. I’d suggest a read through S. Layla Heimlich (2014) New and emerging roles for Medical Librarians, Journal of Hospital Librarianship, 14:1, 24-32, DOI: 10.1080/15323269.2014.859995. Also, Aoife Lawton (2014) The Value of Health Libraries and Librarians to the Irish Health System, The Irish Medical Journal, 107:3, 90-92. I also see a major role for healthcare librarians in patient education and information and there are numerous examples of such initiatives taking place around the globe – from bibliotherapy and book prescriptions to personalised health management and public health promotion. So, there are opportunities but it will be up to the individual to carve a niche for themselves because librarians don’t generally spring to mind as a solution to these issues. The other side to this is the upskilling required to meet the demands of these new roles. There is growing pressure to establish core skills and competencies for healthcare librarians to underpin an evolving profession. A good read on this would be Aoife Lawton & Jane Byrne (2014) A review of competencies needed for health librarians – a comparison of Irish and international practice, Health Information & Libraries Journal, 2014 Dec 30. doi: 10.1111/hir.12093. [Epub ahead of print]. Health Librarians in particular work in an evidence-based world and actively promote the use of evidence in practice. At the same time, we are lacking in a strong body of evidence to underpin our own profession – my first piece of advice would be to get involved from the outset in research that will strengthen our own evidence base. Secondly, the papers highlighted in Q9 present a range of roles and opportunities but in reality these roles rarely exist and we have to be prepared to advocate for their introduction. Think about what you could achieve in terms of added value, beneficial outcomes, cost savings and so on – these are most likely to gain a positive hearing. Thirdly, while health librarians work in a range of different settings from Academic to Special libraries, there are many working as solo librarians and this can be a challenge. I strongly recommend getting involved in (or initiating) collaborative projects, library committees and groups, discussion lists as a means of keeping in touch. I worked in financial services for 13 years where I worked in a variety of legal, compliance and project management roles. Then I decided to change career and I went back to college in UCD where I got my Masters in Library and Information Studies. When I graduated, I got a short-term contract in Limerick as a librarian in the University Hospital Limerick. 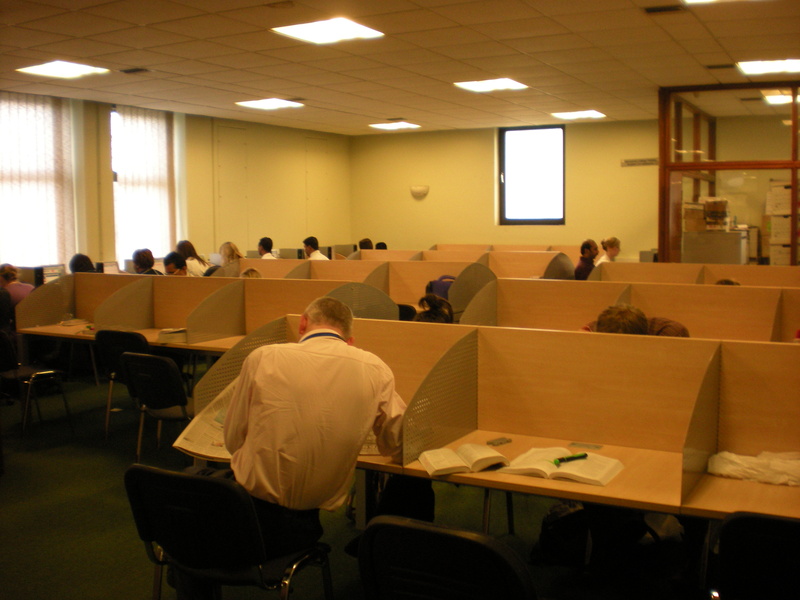 That was followed by another contract position working in the Glucksman Library in the University of Limerick. My experience in those roles really stood to me when I applied for my current position. Supporting Clinical Audit – I usually do at least one Clinical Audit support session each day. The hospital has a strong ethos of continuous improvement and encourages all staff to conduct clinical audits. My role involves everything from assistance with the paperwork required to start an audit through to providing guidance on the design of audit survey questions to support generation of useful reportable information to helping staff edit the final results. I also provide training and guidance on using Sphinx software to design clinical audit questionnaires. Conducting literature searches. This can be as simple as sourcing suitable articles for a journal club, through to identifying 30-40 articles to support development of a new policy. Engaging with suppliers regarding subscriptions. Cataloguing the journals or books which have come in using Heritage library management software. Editing the hospital newsletter. I coordinate the editorial committee meetings, minute the actions, assign deadlines and follow up with each of the contributors to ensure that they have their submissions in on time. I am also one of the magazine’s copywriters, so I have to write at least one article for each issue. I use Microsoft Publisher for designing the newsletter which will go out in print and online format. Supporting HSELand (an e-learning website) training sessions. Usually this involves talking a client through how to register for HSELand, what course they need to enrol on and how to follow through the steps. However, some clients require more guidance than others. The spectrum of computer proficiency in a hospital environment ranges from highly tech-savvy to staff with very little experience with PCs. Many hospital staff don’t work with a PC during the day or use them only for very defined tasks. So, it is important for them to have someone there to take them through the process. Providing one-to-one training sessions for clients on using the library’s resources. Monitoring and managing the Library’s Athens accounts. Athens is an authentication package which allows staff access library resources remotely. Managing document supply and inter library loan requests. Managing the physical stock. 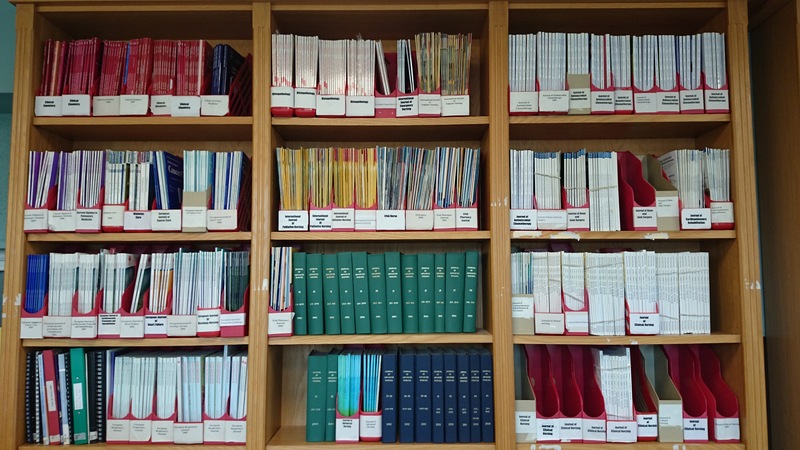 This can be anything from collating and sorting journals for binding, through to re-stocking shelves. After work I spend time editing content for the Health Sciences Library Group (HSLG) magazine HINT or working on HSLG Committee items (we are currently planning for our annual conference which is taking place 14 & 15 May) or reading up on educational information. Being involved with LAI committees is a great way to keep in touch with other librarians, which is particularly important when you are in a solo role. Reference skills are important, because an occupational hazard of working in health libraries is that your client assumes that your knowledge of medicine is the same as theirs. Cataloguing is another traditional skill that is essential, whether that is cataloguing serial receipts or adding new books to the collection. Desktop publishing is definitely something I would recommend as essential. Photoshop skills are also an advantage. Heritage Library Management System for the daily circulation items. Sphinx software for clinical audit survey design. Microsoft Publisher for newsletters. The most rewarding part of my role is seeing the positive and immediate impact I have on people. Recently I was working with a client with dyslexia, helping with coursework applications and identifying the software and resources necessary to support their study. The client said that, until those sessions with me, no-one had ever worked with them in a way that suited their particular learning needs. I knew then that I had absolutely made the right decision to change career. Communicating the value of the Librarian in a medical environment. There is an increasing belief that the answer to everything is to simply use online resources. Assuming that all our clients have the knowledge, understanding and ability to engage with electronic resources is a disservice to them and also to Librarians. Resource provision is only a small portion of a Librarian’s role. We are educators who support individuals in their training and development needs. We are researchers providing relevant, appropriate material to healthcare staff so that they can spend their time looking after patients, not floundering around the internet looking for information. We are managers who handle budgets, resources and clients, in the same way that any other business manager does. 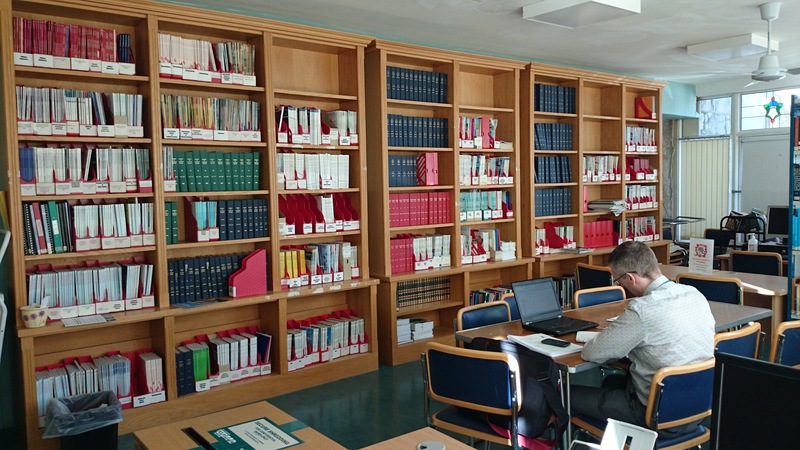 There are plans to create a centralised library structure within the HSE but it is not yet clear whether this will be a positive or negative change. Will it be used as a push to centralise electronic library resources, with a subsequent removal of hospital librarians? Or is it intended to enhance the provision of library services at each individual hospital by a professional librarian or librarians? And what will the impact of centralising HSE library resources be on healthcare librarians outside the HSE? That being said, I think the current push towards outsourcing research to private companies/consultants rather than having in-house expertise could open up new opportunities for medical librarians who are interested in working for consultancy firms, rather than being directly employed within the healthcare sector. As a medical librarian in a small/solo library, you are essentially a sole trader. The business rises or falls with you. You need to be self-motivated, flexible and able to work to a deadline.